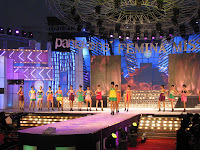 In one of Asia’s most widely viewed events of the year, SOUND.COM of Mumbai provided a JBL VERTEC® line array system for the Pantaloons Femina Miss India 2009 pageant in Mumbai. The event, which selects India’s three different finalists for participation in the Miss Universe, Miss World and Miss Earth international beauty pageants, was staged at the Andheri Sports Complex for a live audience of 4,000 fashion-industry and global media professionals. This year’s Miss India pageant was broadcast live to more than one billion viewers across 72 countries. Joining D’Souza onsite, the top-tier crew from SOUND.COM included Gilroy Valladares, Sunil Karanjikar, and Fali Damania for sound system setup, optimization & operation. Assisting backstage were Yusuf Shaikh, Yasin Shaikh & Ranjit Singh along with supporting technicians Piyush Singh & Kalpesh Ajare. The SOUND.COM team designed and set up a multi-array system for the event, selecting from the company’s extensive rental inventory of JBL VERTEC line array elements. The main PA system for the pageant featured two pairs of line arrays per side, each containing eight JBL VERTEC VT4888 midsize line array elements. An additional six VT4887 compact line array elements per side satisfied out fill requirements. Additionally, four VT4880 full-size arrayable subwoofers per side complemented the system. VRX932LA compact constant-curvature loudspeakers provided front fill and flown center fill coverage, while VRX932LA speakers with VRX918S subwoofers were in use as an onstage side fill system. SRX712M monitors were used for backstage paging. Crown I-Tech 8000 amplifiers powered the system, while a Soundcraft Vi6 digital mixing console was utilized at the front of house position.